That factor, more than any other, is hampering Michigan’s ability to adequately upgrade roads, he said. Chatfield is leading majority House Republicans who will be critical to Democratic Gov. Gretchen Whitmer’s pending push to inject more spending into roads and bridges. Chatfield’s focus on taxes assessed at the pump is not new. A 2015 ballot initiative proposed by lawmakers — and soundly rejected by voters — would have doubled per-gallon fuel taxes but eliminated the sales tax on gasoline and diesel to ensure that all taxes at the pump went to transportation. It was a complicated, multi-faceted proposal that also would have increased the sales tax while boosting spending on education and local governments. GOP legislators and former Gov. Rick Snyder later raised fuel taxes and vehicle registration fees to increase road funding, but the plan has been faulted as inadequate. Chatfield wants to revisit taxes at the pump. Michigan is among a small number of states to apply the sales tax to motor fuel — a factor in why its gas taxes were sixth-highest in the U.S. as of July, according to the Tax Foundation. The sales tax revenue mostly goes to schools and local governments under the state constitution. Asked about the potential impact on schools, Chatfield said boosting roads should not come at their expense. “Let me be very clear: We will not turn back the clock on education funding in this state,” he said. Removing the sales tax on fuel would require a statewide vote. Another option could be to keep it intact and shift an equivalent from elsewhere in the budget to roads — an approach that already is squeezing the general fund under 2015 road-funding laws. Chatfield said fixing the roads is a priority not just for Whitmer, who campaigned on it, but also lawmakers and residents. “They made that clear in November,” he said. 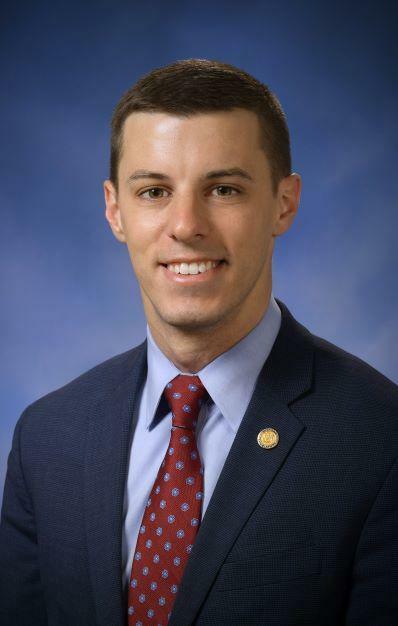 Chatfield, 30, is believed to be the youngest House speaker in more than a century, though having speakers who are in their 30s is commonplace in the term limits era. He graduated from Northland International University, a Baptist college in Wisconsin, and obtained a master’s degree from Liberty University in Virginia. Before winning election to the House in 2014, he was a teacher, coach and athletic director at a Christian school in northern Michigan that was run by his minister father. Factors in the conservative Chatfield’s victory were his criticism of his Republican primary opponent for introducing a bill to expand the state’s civil rights law to prohibit discrimination against LGBT people and helping to expand Medicaid. Last year, Chatfield was the lead sponsor of a law that wiped clear outstanding state driver “responsibility” fees for hundreds of thousands of motorists. He unsuccessfully pushed for a state income tax cut in 2017. He will lead the chamber the next two years before reaching his maximum time in the House. He has emphasized bipartisan cooperation with Democrats while quickly putting his stamp on how legislative business is to be conducted. Many bills will now go before two House committees instead of one before moving to the floor. Top goals, he said, include reducing the high cost of car insurance and changing the criminal justice system to help inmates succeed upon their release and to prevent overcriminalization. He also wants to expand government transparency by opening the Legislature and governor’s office to public-records requests. “Though we’ll have disagreements, what will define us is our ability to come together and provide solutions,” he said. The leader of the Michigan House says President Donald Trump will not deliver his State of the Union address in Lansing. Republicans opened the term Wednesday with smaller majorities in both chambers following the November election. The state Legislature could tackle a topic this term that it couldn’t get past the Senate before. Some lawmakers – including new leaders - are making transparency a priority. The state Legislature will return on January 9th with new leadership. Capital Correspondent Cheyna Roth tells us about the priorities of Republican leaders in the House and Senate.